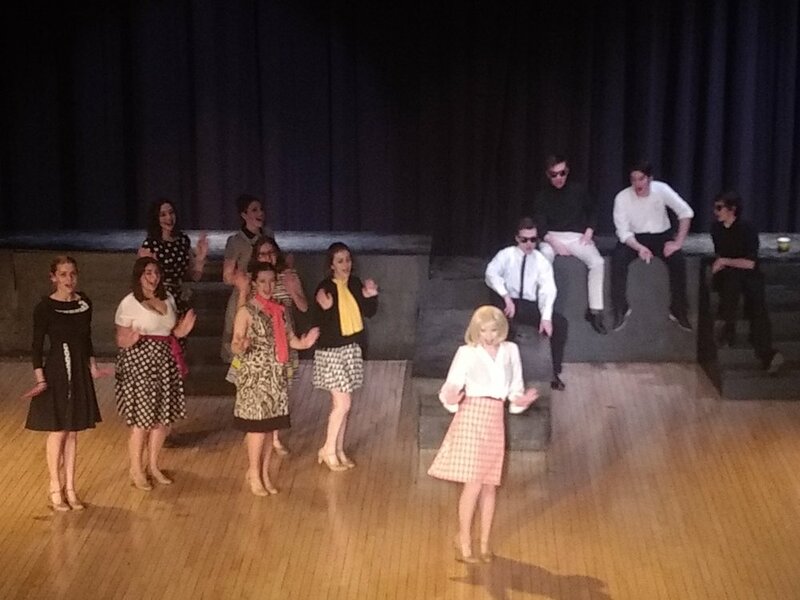 Leader of the Pack: The Ellie Grenwich Musical was directed by Teresa Madden-Harold at Taylor Allderdice High School in April 2019. I apologize for the low quality of the images for this show. 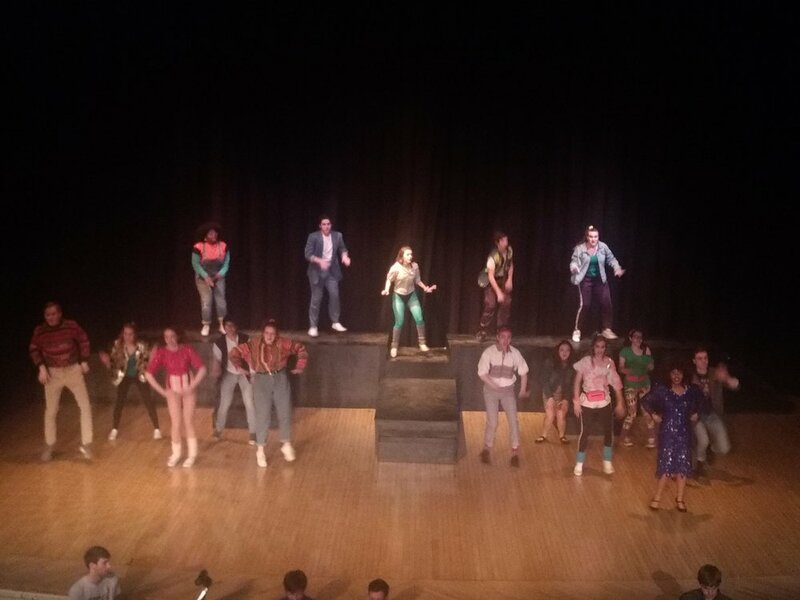 For this show, I was working with a very limited number of lights, and had to make a number of compromises in order to get anything like the effect that the director and I settled on. We chose to set up 7 acting areas rather than 9 due to the limited number of lights, each of which could be lit in a neutral tone, a warm tone, and a cool tone, and I mixed them to provide natural lighting for dialogue scenes and either warm or cool lighting for songs, depending on the mood of the song. Additionally, we were able to rent a spotlight to help highlight the lead singer of each song. I generally attempted to have light primarily on the acting areas in which the songs were actually taking place, while leaving the remaining areas dim. This can be seen in Be My Baby in which the platforms in the rear are unlit, while the three singers are brightly lit in warm light and a spotlight. Here, on the other hand, the entire stage is well-lit to cover all the performers. Here you can see an example of the natural lighting I created for dialogue scenes. It was primarily neutral-colored frontlight, with an addition of warm frontlight and cooler backlight, to fill in shadows without overly coloring the shadows. In some cases, I lit different parts of the stage differently. Here, the girls are singing while the boys watch - I therefore lit the down areas of the stage warm to match the girls’ song while leaving the platforms lit in the cool light that had dominated in the previous scene. Here, similarly, the boys are warmly lit while the girls are in cool light only. Due to the limitations of the space, it was tricky to provide warm lighting for this song while still maintaining the cool evening look of the setting. I attempted to do this by keeping the warm light primarily on the actors for Ellie and Jeff, while the rest of the stage was lit but was still darker and cooler.